Located southwest of Genoa on the Italian Riviera, Portofino has been the preferred holiday spot for the world's wealthiest since the first elegant villas and hotels were developed in this small fishing village in the early 20th century. In 1935, Portofino was declared a national monument, ensuring its continued success as an elite vacation destination by preserving the historic architecture and the lovely surrounding landscape. If you don't bring your camera to Portofino you will regret it. The town is striking with its brightly colored antique buildings hovering over sparkling blue water. And the surrounding luxuriant green hillsides of the Portofino Promontory are equally stunning. Here you'll find some very attractive walking paths through one of the largest concentrations of flora and fauna in the Mediterranean. For some fantastic views of the entire bay and the Tigullian Gulf, walk from the Piazzetta (the central town square) up the hill to the Church of San Giorgio. Perched high above the town, this church contains relics of St. George brought over by crusaders from the Holy Land. 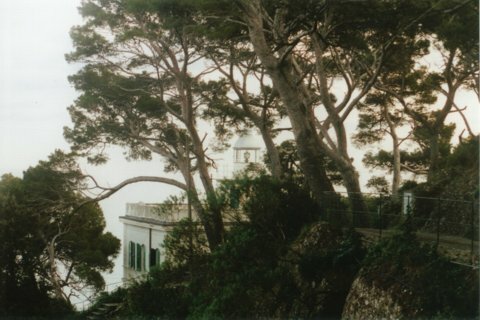 From here you can walk to another great lookout point at the Punto del Capo, the Portofino lighthouse. When in Portofino, find your way to the Church of San Giorgio (St. George). From there you can walk to Punto del Capo, the lighthouse.